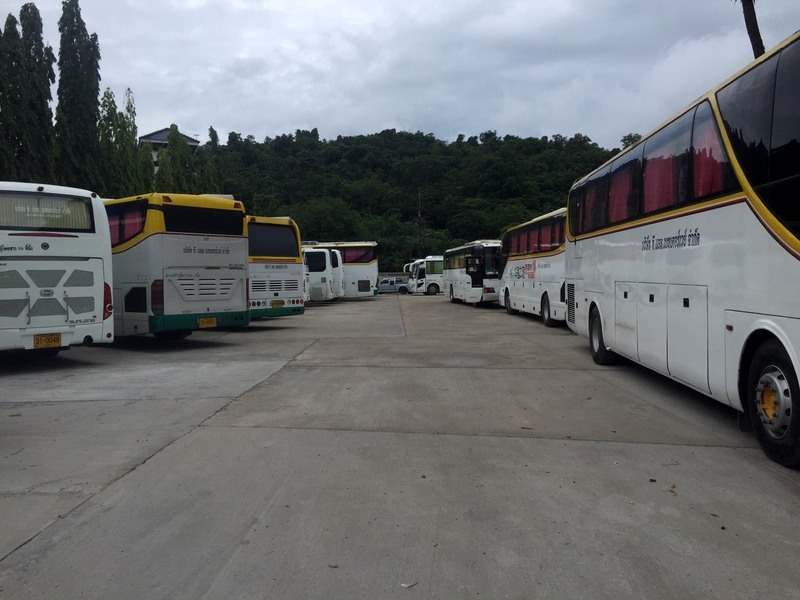 PHUKET: More than 100 officers including police, military and anti-money-laundering officials seized 29 boats and 53 buses belonging to companies operating under the Tranlee Travel Co Ltd network of businesses in raids at Rassada and Koh Siray, on the east side of Phuket Town, this morning (July 6). 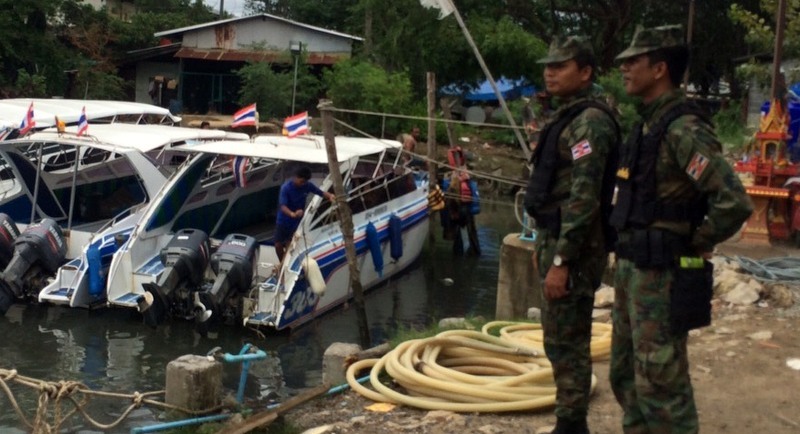 Officials led by Region 8 Police Deputy Commander Col Phorasak Nuannoo led the raid to seize the 29 tour speedboats at the Insee Marine Co Ltd private company pier located near the bridge joining Koh Siray to the mainland, Phuket Provincial Police Chief Col Teeraphol Thipjaroen told The Phuket News today. 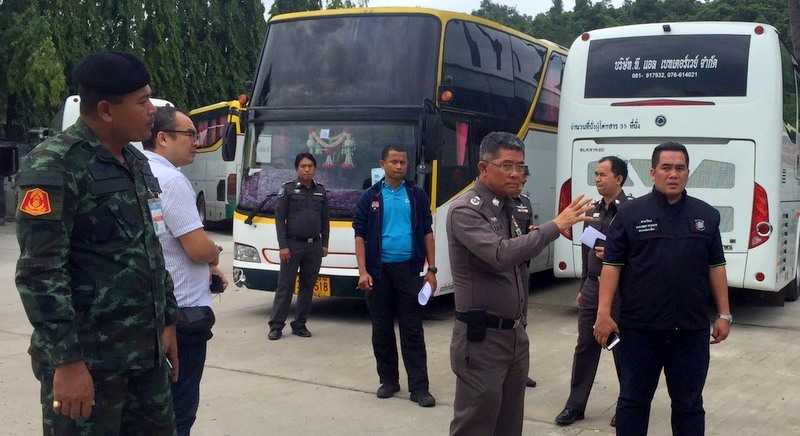 “The second group, led by Lt Col Pongpop Prasoppichai of the Phuket Provincial Police, raided the offices of T.L Better Way Co Ltd at Koh Sirey, which provided bus services for tourists, and where police seized 53 buses,” he said. 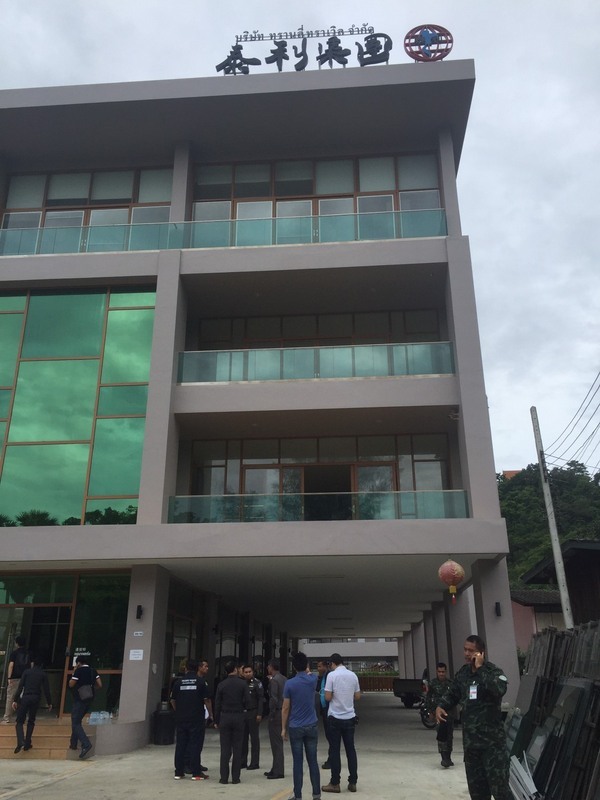 A third group, led by Lt Col Rattakhet Munmuang of the Phuket Provincial Police, searched Racha Spa Co Ltd at Phuket Villa 5 in Wichit, where officers seized all documents, including registration licenses and accounting records, he added. All three teams of officers were armed with warrants issued by Phuket Provincial Court, Col Teeraphol said. The raids today follow Royal Thai Police Deputy Commissioner Gen Srivara Ransibrahmanakul yesterday (July 5) announcing that five of the subcompanies operating under Tranlee Travel Co Ltd had been shut down. “The Tranlee CEO, Kritchakorn Rungmongkolnam, or Mr Isam Sainglee turned himself in after officials had a warrant out for him and raided his company,” Gen Srivara said. “His partner, Weerachai Kampaipraphankul, is wanted by police and still at large, but we believe he still in the Kingdom,” he added. 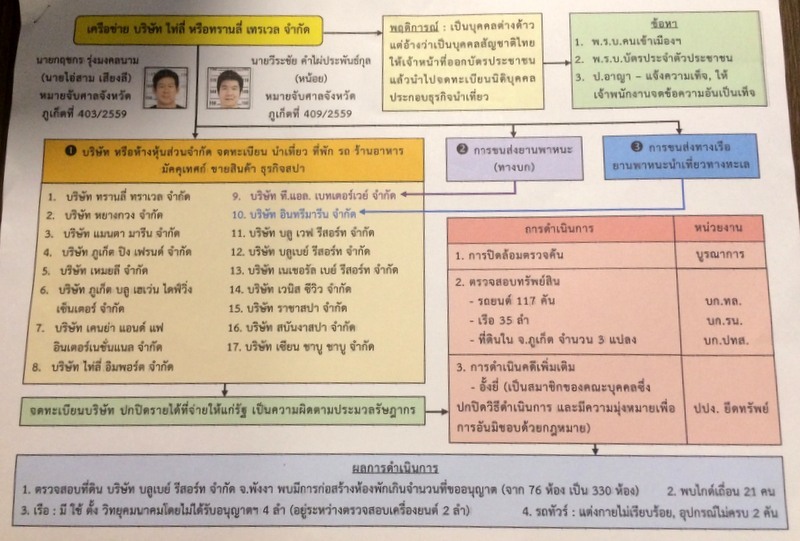 In the June 16 raid, Phuket Provincial Police Deputy Superintendent Col Saman Chainarong said that “Kritchakorn” (Isam Sainglee) and “Weerachai” were foreigners who had both obtained fake Thai national identification cards in Northern Thailand. 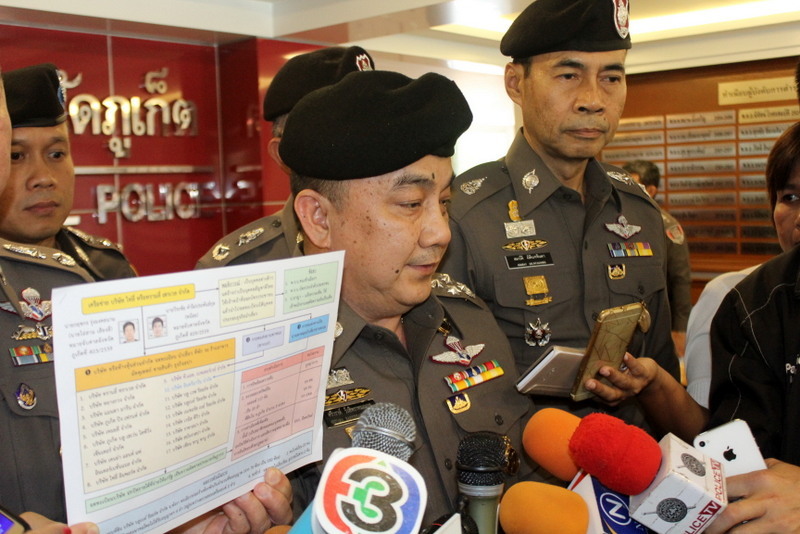 The warrants issued for both men accuse them of staying in Thailand illegally, possession and use of fake identification and using fake identification documents to register tourism businesses. However, Gen Sriava yesterday did not reveal the real name of “Weerachai” or confirm the men’s nationalities. Gen Sriava said that six companies operating in the Tranlee network – including Tranlee Travel Co Ltd – had been shut down, but did not name specifically which ones. “The network includes tour companies, accommodation businesses, tour guides, restaurants, shops and spas. These companies are registered, but did not report their true income to the government,” Gen Srivara said. “I have ordered officials to strictly enforce the law and anyone found in connection to this case, regardless whether they are a former politician or an ‘influential person’, all must be investigated and punished accordingly,” he added. “Our investigation revealed that Blue Bay Resort Co Ltd, located in Phang Nga, had added more rooms to their accommodation without a permit. Initially the company asked for a permit to build 76 rooms, today the resort has 330 rooms,” he said. “Also, officials have found 21 illegal tour guides, four boats fitted with a radio communication system without a permit, two buses fitted with the incorrect engines and drivers dressed inappropriately for conducting tours,” he added. “All suspects involved in this case will not get away with this,” Gen Srivara said. Even nominee shareholders will face charges, the police general warned. “Nominees shareholders involved in this case with less than 50 per cent ownership will face the law,” he said. “Investigations into companies in Phuket using nominees will continue because Phuket is a key target area prone for illegal nominee operation,” he concluded.